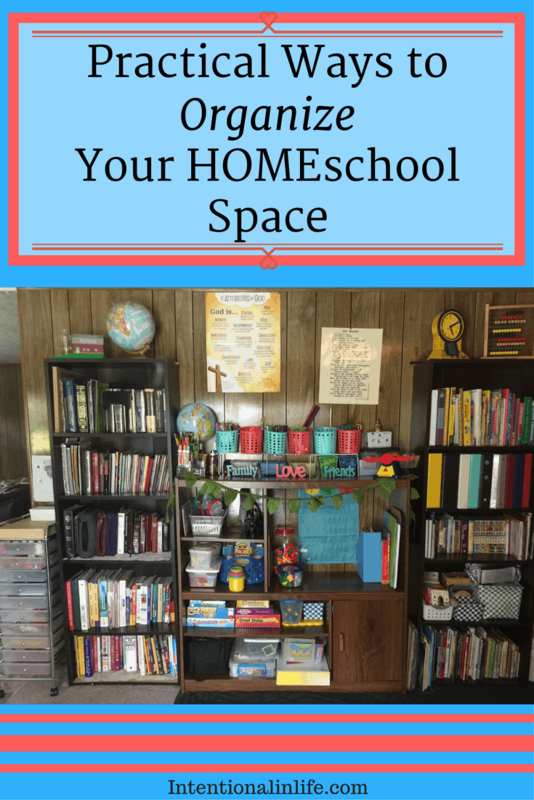 Creating an organized HOMEschool space in your home is not very hard to do. In fact, it’s easy. No, really it is! The only thing you need to organize your HOMEschool space is love. Now hear me out! I know you are thinking what does love got to do with organizing your homeschool space. It HAS a lot to do with it. Let me explain. 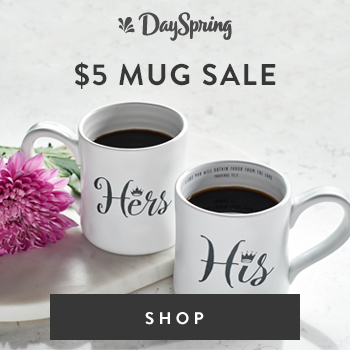 What does love got to do with organizing your HOMEschool space? When we organize our home we do it because we love our family and want to provide an orderly home for them. We want to create a relaxing and peaceful home that can cultivate the love of learning in our children. We want to provide them with an exclusive, customized education. So we spend a lot of time researching to find the best curriculum, supplies, books, etc. for the upcoming school year. When we finally gather all the school materials, books, supplies, etc. the next step is to organize it all. We want to bring order to the chaos. So organizing and putting things where they are easily accessible for our children become our goal. We want to make things practical and functional. So in preparing to organize everything we have for the upcoming school year, we do it all in love! 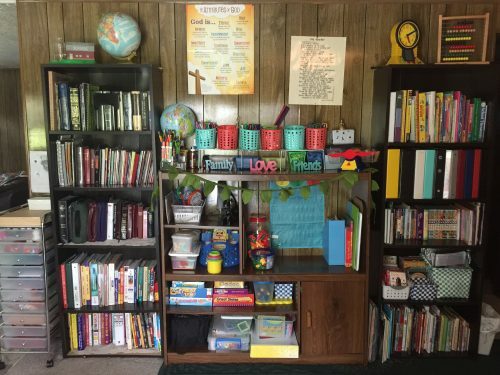 An organized HOMEschool space doesn’t need to be in a specific room. It’s ok to search the internet for ideas or look through organization books to help us organize our space but honestly I find myself feeling discourage instead of inspired. Why? Because I start to compare my homeschool space with the pictures that I see. I have stopped doing that and found a way to be content and enjoy my space however it may turn out. Being content has set me free from the comparison game. 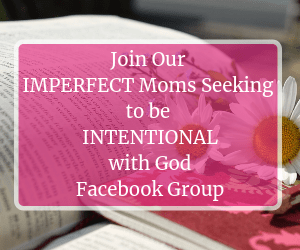 I want you to know that if God called you to homeschool, He knows exactly the space you have available during this season. The space you have now will be enough and will serve your family well. Why? Because you mama will be able to make it work and it will be a perfect space for your family. I know many of us do not have a spare room where we can turn it into a homeschool room but that’s ok. Our homeschool space should be unique and special. 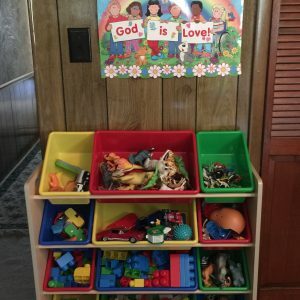 We all have different needs so we create and organize our HOMEschool space to meet those needs. What I love about organizing our HOMEschool space is that I don’t have to re-create school at home. Why should we? 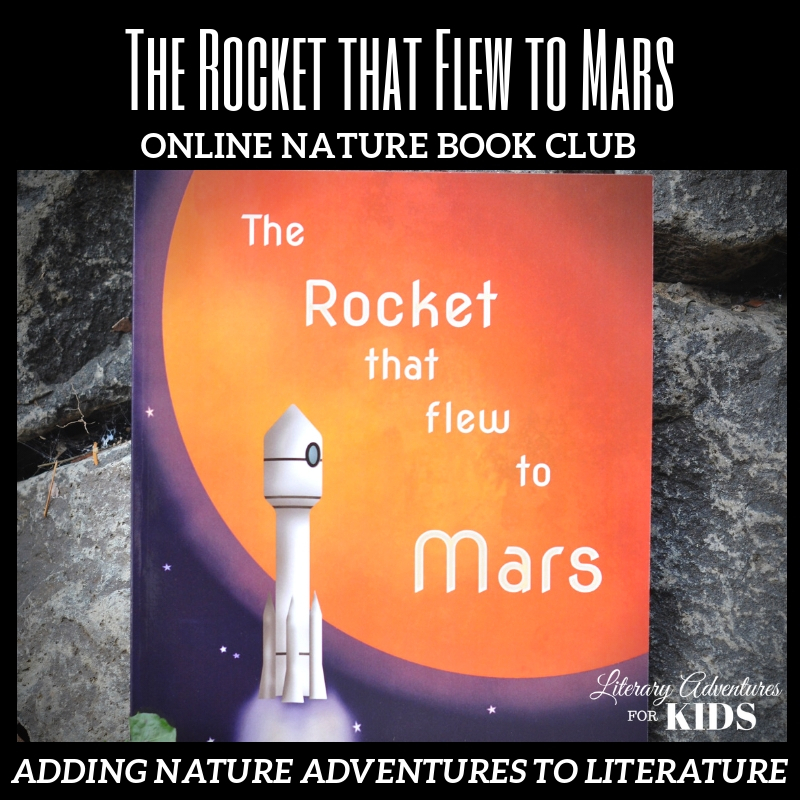 We live at home so our HOMEschool space should feel homey. We can homeschool anywhere in our home. 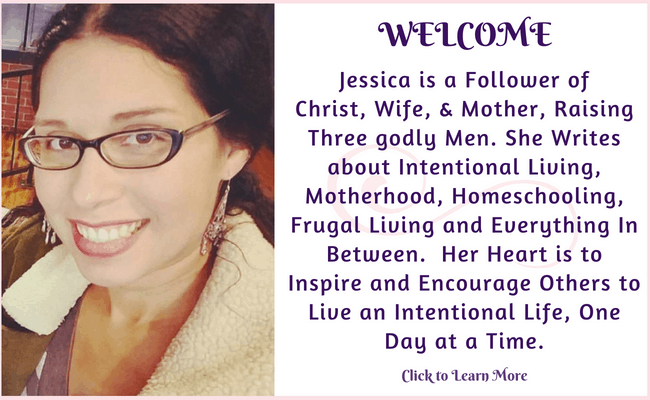 We can homeschool in our dining room, on the floor in our living room, in our den area, on our porch outside, on a blanket under our favorite tree or even in our kitchen. Get creative with your special space and make it your own. Now I don’t have anything against having a classroom set up. There are some amazing homeschool classroom spaces out there that I love. What is important for me though is that my HOMEschool space is organized and it has a relaxing, enjoyable and peaceful feeling to it. Creating organized pockets of learning throughout your home. I enjoy creating pockets of learning spaces throughout my home. They are easy to create. You can prepare baskets of books near a comfortable couch or a portable radio with a small basket of CDs to listen to near their play area. Little things like that will keep them learning and engaged throughout the day. This is a picture of my bookcase unit. I created this unit using what I had at the time and made it work. The tall bookcase on the left holds Bibles, Bible study books/references, our cookbooks and some parenting books. The tall bookcase to the right holds our educational books, curriculums, binders, animals books and Science books. It also holds our educational cds, the Magic School Bus science kits and our nature study field guides and books. All of these things are organized in baskets. The middle unit holds our educational games, Math manipulative, Science experiment kit, nature studies treasures, paints, crayons, markers, etc. All of these things are put away in plastic bins or in baskets. The 10 drawer cart is our Art station. It houses our construction papers, craft materials, stickers, paints anything artsy. I love that I can move the cart anywhere in our home when we are working on an art project. We do a lot of our read aloud in our living room. So I decided to create a little fun learning area for my toddler. It holds his quite toys (like puzzles, trains with a train track, etc.) that he can play with while I read. He also has a basket of books on topics that he is interested in. I rotate both the toys and the books when I see that he is losing interest. 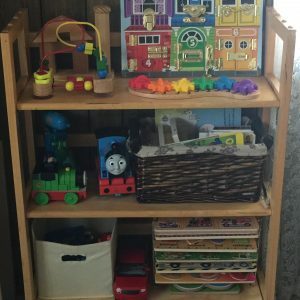 I also have this wonderful sturdy toy organizer which holds many different toys that both my boys play with during their free time. I hope I was able to encourage you to embrace your space and enjoy it. Have fun creating a space that will serve your family during the season that you are in now. Go on and create lasting memories with your children. 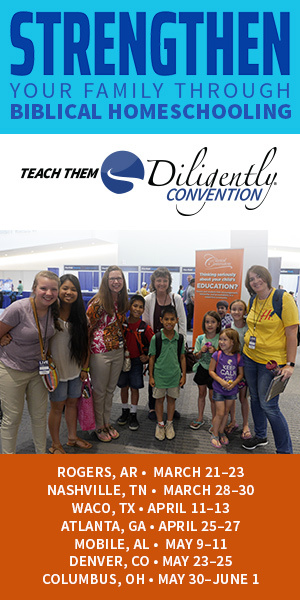 Want more homeschool organization tips and ideas? Check out these posts! Share with me any tips, tricks and hacks you have used to organize your HOMEschool space.